Great Sand Dunes National Park in southern Colorado is home to North America's tallest dunes, rising over 750 feet high against the rugged Sangre de Cristo Mountains. The wind-shaped dunes glow beneath the rugged backdrop of the mountains. This geologic wonderland, containing over 30 square miles of massive dunes, became a national monument in 1932. 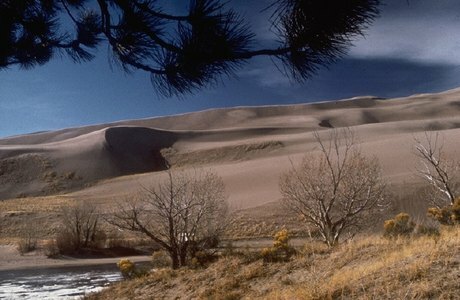 With the passage of the Great Sand Dunes National Park and Preserve Act, resources now also include alpine lakes and tundra, six peaks over 13,000' in elevation, ancient spruce and pine forests, large stands of aspen and cottonwood, grasslands, and wetlands, all habitat for diverse wildlife and plant species.